American Society of Heating, Refrigerating, and Air Conditioning Engineers (ASHRAE) Standard 90.1: Energy Standard for Buildings Except Low-Rise Residential Buildings and the International Energy Conservation Code (IECC) are the major energy design standards for new buildings in the United States. Most states or local jurisdictions have adopted some version of either Standard 90.1 or the IECC as their minimum design standard for all new commercial and high-rise residential buildings. The pattern has been for ASHRAE to update Standard 90.1 every few years and, more recently, to update it every three years. Therefore, its revision is of particular interest to those working with building energy efficiency technologies, including mechanical insulation. Many of the products and services of NIA member companies are used in insulating pipes and ducts in commercial and high-rise residential buildings. The energy efficiency of these buildings depends partly on limiting heat flow to or from pipes, ducts, and equipment, whether they operate above or below ambient temperature. When used for below-ambient service, the insulation systems help prevent moisture condensation on those pipes and ducts, further saving energy. The most recent published version of Standard 90.1 was adopted in 2007, following 2004 and 2001 versions. The newest version, 2010, will take effect later this year, probably by late October 2010. Increasing the thicknesses of pipe and duct insulation. Technologies exist for designing buildings that use 30 percent less energy. In most cases, however, achieving this requires greater coordination between a building’s architect and mechanical system designer than typically occurs. The old approach was for an architect to design a building without any input from mechanical designers, then pass building drawings on to the mechanical designer (or several designers, since the work would typically be competitively bid) to design the mechanical system within both a tight energy budget and a tight cost budget. The new approach requires the architect to understand how his or her decisions impact the mechanical system designer and involve the mechanical designer every step of the way to produce a truly energy efficient building. There is generally no room in this new process for “value engineering,” which leads to the failure of many buildings to meet basic criteria such as energy efficiency standards, maintenance budgets, and longevity goals. What are the new pipe and duct insulation thickness requirements in Standard 90.1-2010? Pipe insulation thicknesses are greater than or equal to those in the 2007 standard, but duct insulation thicknesses have not changed. Overall, this is good news, giving mechanical insulation an opportunity to contribute to greater building energy efficiency. Standard 90.1-2010 contains two tables of minimum pipe insulation thicknesses: one for above-ambient and one for below-ambient systems. 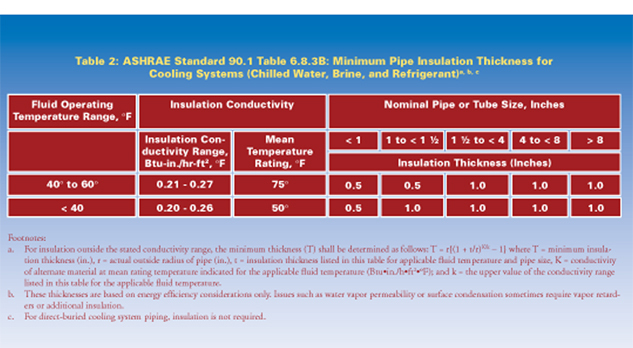 In each table, minimum insulation thicknesses are referenced for both pipe size and for operating temperature. The minimum pipe insulation thicknesses are given in two tables, 6.8.3A and 6.8.3B, in the standard; the values are in Figures 1 and 2, complete with the footnotes. In the new standard, these tables are also reproduced in metric units. 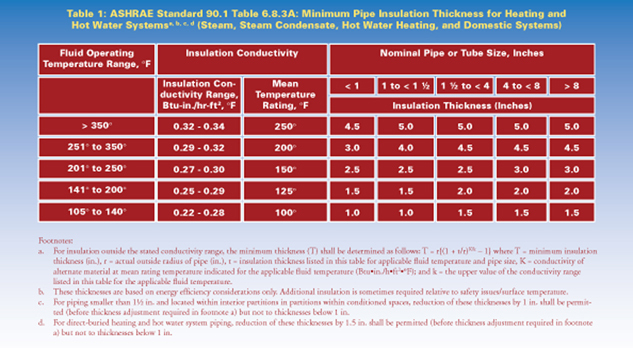 For above-ambient service, the pipe insulation thicknesses in Figure 1 are significantly greater than those normally installed (as they have been in previous versions of Standard 90.1, but to a greater degree in the 2010 version). For many of the steam heating distribution pipes in buildings, with an operating temperature greater than 350°F, 5 in. of insulation (such as mineral wool, fiberglass, or calcium silicate) will be required on all pipes except those with a size less than 1 in. NPS. This will probably require double layering and hence greater labor to install. Mechanical designers will need to allow a pipe clearance greater than 10 in., which is often neglected. Even hot water pipes used for hydronic heating will require 2 in. of insulation on all pipe sizes equal to or greater than 1-1/2 in. NPS. For below-ambient service, by contrast, the new pipe insulation thicknesses are not particularly noteworthy. For example, 1 in. is sufficient thickness for all sizes on chilled water lines (with an assumed operating temperature in the 40°F to 60°F range). This is because these thicknesses were determined for energy conservation, not for condensation control, which often requires thicknesses greater than 1 in., particularly on pipes running through unconditioned spaces. It is also worth noting the equation for insulation materials with thermal conductivity values outside the stated range. For example, cellular glass has a thermal conductivity value, at 55°F mean, of about 0.32 Btu-in./hr-ft2-°F, which is greater than the given range. If the material of comparison is fiberglass, with a thermal conductivity value of about 0.23 Btu-in./hr-ft22-°F at 55° F mean, and 1 in. of fiberglass is required by the table for a 4 in. NPS pipe, then using the equation given in footnote a for both tables, we would need about 1-1/2 in. thick cellular glass for the same chilled water pipe. However, since 1-1/2 in. thick cellular glass would probably be used on a 4 in. NPS chilled water pipe anyway, this is not a major issue. It is difficult to imagine 5-in.-thick removable/reusable insulation blankets installed on valves, pressure regulators, strainers, and other difficult-to-insulate fittings. A major challenge for the mechanical insulation industry is that these components are frequently left either uninsulated or partially insulated in steam and hot water heat distribution systems. Removable/reusable blankets 1 to 2 in. thick are often removed by maintenance personnel and not reinstalled. Removable/reusable blankets 5 in. thick would be even less likely to be reinstalled, since they would probably be heavy and not very flexible. The solution may be for the designer to show that the overall system heat loss is equivalent to having 5 in. of insulation overall and use thinner, more practical thicknesses for the removable/reusable blankets. When ASHRAE Standard 90.1-2010 takes effect later this year, compliance will require greater pipe insulation thicknesses. On steam distribution pipes in buildings, those thicknesses will increase from 4 in. to 5 in. on most pipe sizes when using materials such as mineral wool, fiberglass, and calcium silicate. Lower-temperature, above-ambient pipes likewise will require greater thicknesses than those required in the previous Standard 90.1-2007. On below-ambient pipes, minimum insulation thicknesses will be only 1 in. for most insulation materials. New buildings designed and constructed in compliance with Standard 90.1-2010 will be designed to use 30 percent less energy than those in compliance with Standard 90.1-2007. These new minimum design requirements, when followed, will result in significant energy savings in new buildings. However, it will take time for the states to adopt this revised standard.